Lee Ufan, Korean artist and founder of the Mono-Ha group, lives in Japan but is a nomad who has succeeded in uniting the language of the Western avant-gardes and the culture of the Eastern ones. Going beyond the ready-mades of Cartesian Duchamp and the cuts of Baroque Fontana, Lee Ufan replaces the principles of representation with that of contemporization, in a process that has been ongoing since the Sixties, with sculptures and installations, evolving with the "Correspondences" of the Nineties and the paintings of today. Without any contradictions, he has created an encounter between space and time, replacing the concept of form with that of "structure" and that of space with that of "field", a system of relations open to developments that tends to form a unity between full and void. 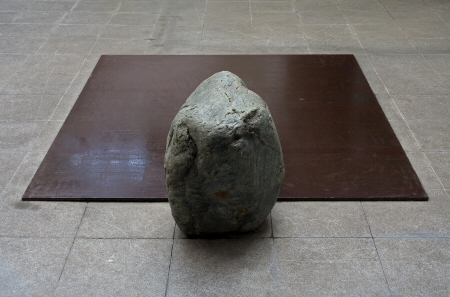 The entire research of Lee Ufan aims to undermine the "objet trouvé" and its metaphysics: a dead form, contoured against the aesthetic space, removed from life. Lee Ufan, on the contrary, does not represent but contemporizes an idea of active temporality that sustains the encounter between the artist and the world, and between the work of art and the spectator. At one point, a "tache" is immediately irradiated against the active surface of a painting, that becomes an epiphany of a meeting with the public. At another he creates paintings where he is the omnipresent artificer of everything. The signs orchestrated on the canvas have a tension, an itinerary and a spatial duration staged in the name of a manually drawn yet standardized measure. A measure memorized by a gesture that does not forget precision and energy, the smoothness of craftsmanship and the geometry of extension. These spaces often represent architraves of vision, in the order of two or three they structure the spatial field in terms of visual essentiality, to underscore precision and indefiniteness, constriction and potential change. It is as if the artist wants to give the strong sign traced on the surface of the painting the solid volume of an object or material, as those he once used in his installation. The impact of the trace serves precisely to intensity the moment of encounter between the work and the spectator, through the interaction between time and space, dimensions that are both necessary to realize the value of art, that of its contemporizing. And so Lee Ufan solves the problem of the immortality of the work of art, without wanting to mortgage the future, instead laying the foundations for a persistent present. Creating an eternal present becomes, to the Eastern artist, a way to on the one hand do without the pathetic system of predictions of the future, and on the other to mortgage, through a different dimension of space, a field vast enough to house the time of its constant heartbeat.